Snapino™ is an introduction to the open-source Arduino hardware-software coding environment embraced by the Maker community worldwide. Arduino is the most popular microcontroller used by Makers and Do-It-Yourselfers to MAKE and DO. No need for bread boarding since Snap Circuits® snap together and make prototyping circuit designs a snap! Our Snapino module is an Arduino UNO board with all normal features and is compatible with other Arduino shields and components. 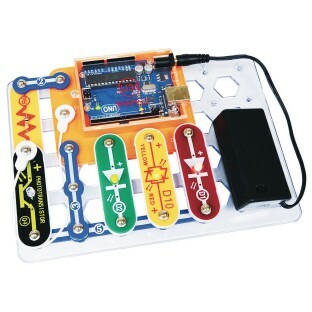 Snapino can be used with other Snap Circuits® sets to make larger circuits. Includes 20 projects that gradually introduce you to Arduino coding with sketches (programs) already written for operating the 14 included parts. 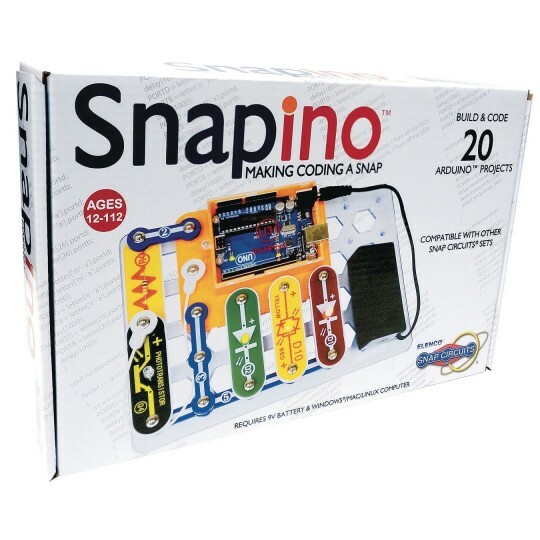 Additionally, you will find sketches written for Snapino with other Snap Circuits® sets so you can keep your fun going. Includes Arduino UNO compatible Snapino Module, 6 Snap Circuits® modules, 3 snap wires, snap jumper wire, snap-to-pin wire, USB cable, 9 volt battery holder, and manual. Ages 12 and up. Requires one 9-volt battery (not included). You will need to download the Arduino application from Arduino's website and download Snapino Sketches (programs) from the Elenco® website.